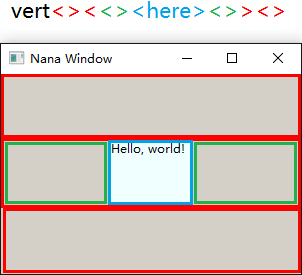 Nana is a cross-platform C++ library for creating graphical user interfaces, currrently it supports Windows, Linux(X11) and Mac OS(experimental) platforms. Nana is a free and open source software, licensed under Boost Software License, it encourages both commercial and non-commercial use. Nana is a modern C++11 library, it means that users have freedom for various modern C++ features, lambda, smart pointers and the standard library. The secondary, Nana is a library, not a framework. A side benefit of this practice can be a less impact on program structure design. Click the following button to get the latest Nana release package. An Installation Document describs how to install Nana using different tools under different OS platforms. //Include a label widget, we will use it in this example. //when a form instance is created. //The new window default visibility is false. //input until the form is closed. The screenshot shows that “Hello, world!” is displayed at the left-upper corner in the form. We can find that the code line 20 position the label at an absolute point(10, 10). Now, let’s start another example that illustrates the layout management of Nana to position the label at the center of form no matter what the size of form changes. //Set a background color, just for observation. //Define a layout object for the form. The key of layout management using class place is the div-text. The following picture illustrate the definition of div-text. The div-text divides a large area(form) into small areas(the small area is called field). The vert specifies the 3 red fields lay out vertically. The second red field has 3 child fields which lay out horizontally. The named here field has a fixed width that is 80-pixel. The 2 green fields make the named here field in the middle of the form. Great Lib! I have tried to use it on the RPI and it is working ok.
Hi, MBA, thank you for trying nana. Why is your library called ‘nana’? Does it mean ‘grandmother’? Haha, I don’t know that ‘nana’ implies ‘grandmother’ in Canada. It’s nickname of my wife. I’m not good at naming, nana is just simple and easy to remember, so I chose the name. I asked, because my wife wanted to know what this nana thing was. When I told her what you said, she said “Don’t you dare name a bit of software after ME!”. Could I embebbed a OpenGL or DirectX window with this library? How can I achieve it? There are 2 ways to embedbbed a OGL/DX window. 1. Create a OGL/DX window as a child window of a form. 2. Render with OGL/DX directly on a form. Please refer to the example for details. Is there any ui designe toolfor the nana. When I change the interface of the software, I just need to change the ui files, not to change the code and re-compile. It is meaningful! There is a UI designer created by contributor, but implementing a such project is not an easy job. Another way for dynamic changing UI is to use the place and reload a new div-text at runtime. Maybe you could try the tool https://github.com/walkinsky8/nana-runner created by me. I’am thinking about how it works.Without windows api ,how you create the window?And,how you draw these words on it? Thank you very much for pointing out this grammar error! Hi and thank you for this GUI library. 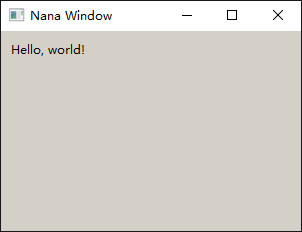 (the example “hello world” who use namespace nana::gui doesn’t want to compil with error: “nana::gui is not a namespace”). Could you please provide some compilation examples who should compil please ? Hi, it seems the example codes are too old. Could you please show me your code or the URL to the example codes? but it seems that all your examples are to old maybe ? or i don’t know, which one do you provide (example) who is working at compil time please ? in fact, which one can be compiled actually ? Thank you for making nana available. The introduction on the nana website says nana does not rely on #defines. I personally feel the straight-forwardness using it. 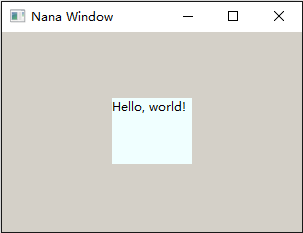 nana 1.7 works in Windows 10 x64 + VS2017 + MSVC — as 64-bit build. In the “Getting Started” documentation, some examples did not compile yet many built and run successfully. Interested readers may perhaps carry on to the next examples. In my experience these examples awaiting correction bears no significant drawback to the overall learning curve. Jerome, I’m very sorry. That example is extremally old – 2014 !